The first step in Clinique's 3-Step Skin Care System. All the benefits of Clinique's dermatologist-developed Facial Soap in a liquid formula. Cleanses without stripping protective lipids. Convenient pump dispenses just the right amount. 125 ml - full size. Clinique Liquid Facial Soap Mild Duo for Dry/Combination 100ml (2 x 50ml) NEW and Unboxed as part of bigger gift sets. Step 1 in Clinique's customised 3-Step Skin Care System and with a non-drying formula, it leaves all skins feeling fresh, clean and comfortable. CLINIQUE CLARIFYING LOTION 2. LARGE 487 ML WITH PUMP. Lovely liquid face wash for oily skin (types 3 and 4). Genuine product. For sale is 1 x 60ml Clinique Clarifying Lotion 2. Clarifying Lotion 2 - New. Gentle exfoliating lotion developed by Clinique's dermatologists de-flakes to reveal clearer skin. Step 2 in Clinique's 3-Step Skin Care System - and the difference-maker for great skin. Clinique 200ml Liquid Facial Soap Extra Mild very dry to dry. Condition is New. Dispatched with Royal Mail 1st Class. Exfoliation is the engine of skin renewal. 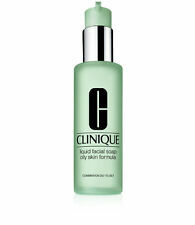 Why Clinique's dermatologist-developed Clarifying Lotion is the difference-maker. Optimises cell turnover. Uncovers skin's natural radiance. Skin appears smoother, softer, with more light-reflecting qualities. For all skin types. Lightweight cleansing balm quickly dissolves stubborn eye and face make-up, including those with sunscreen. Transforms from a solid balm to a silky, fluid oil upon application. This is the full 125 ml size. 2 x 15ml jars of CLEANSING BALM. worth £5.76 based on the RRP full sized 125ml jar £24. you will ALSO get the bag in the photo. Size 50ml x 2 bottles, ideal to try and for travel. 100% Fragrance Free. 200ml (4 x 50ml)- states not for sale. Clinique Liquid Facial Soap Mild Skin Formula. Dry / Combination skin. Failure to do this will result in invalidation of the claim. CLINIQUE Clarifying Lotion 2 (Extra Large) 487ml Pump. Sold as seen. Bag will automatically be added to your order. CLINIQUE Pep-start 2 in1 Exfoliating Cleanser. Clinique Deep comfort Body Butter 30 ml. Clinique make up bag. Clinique Liquid Facial Soap Mild Skin Formula. Dry / Combination skin. Failure to do this will result in invalidation of the claim. Lovely liquid face wash for dry skin (type 1). For sale is 1 x 150ml Clinique Liquid Facial Soap Tube Mild (Dry Combination). Step 1 in Clinique's 3-Step Skin Care System - Dermatologist-developed liquid soap cleanses gently yet thoroughly. With tepid water, lather Liquid Facial Soap between palms. Clinique Liquid Facial Soap Mild – Gentle, effective cleansing for Dry Combination Type 2 Skin 200ml & 50ml [250ml]. New / never been used – unboxed. Clinique liquid facial soap oily skin formula 30ml new travel size. Condition is New. Dispatched with Royal Mail 2nd Class. Marked not for sale Will combine postage on my Clinique products I have for sale, please ask re costs. 200ml pump. Clinique Liquid Facial Soap Mild Skin Formula. Dry / Combination skin. Failure to do this will result in invalidation of the claim. The convenient pump dispenses just the right amount of Clinique Liquid Facial Soap Mild. What it is: A soft, nondrying lather that cleanses gently and thoroughly. Who it's for: Extra Mild is for very dry to dry skin types; Mild is for dry combination skin types; and Oily Skin Formula is for combination oily to oily skin types. What it does: Clinique's guiding dermatologists believe in simple, effective cleansing: soap and water. It protects skin's natural moisture balance so there's no taut or dry feeling. How to use: Use twice a day, morning and night. Lather between your palms with tepid water. Massage over a makeup-free face and neck. Rinse thoroughly and pat your skin dry.